Have you ever found yourself struggling to store the ladder that you require frequently for your job? Do you need to have your ladder stored in your work truck for when you’re working onsite but it won’t fit in your vehicle easily? You might think that there are no options for you, but thankfully there are. One of the easiest and most efficient ways to keep your ladder with you at all times is to use a telescopic ladder. Not only can it help you to easily transport your ladder with you everywhere you go, but it makes storage a breeze by allowing you to contract the tool, producing a smaller footprint. While they may seem simplistic in design, telescopic ladders are actually a very innovative tool that suits a variety of activities. Telescopic ladders are simply ladders that feature an extendable design that is built in parts that overlap and move up and down just like the zoom lens of a telescope. This way, they can collapse and extend easily, and will save tons of space in storage. When extended, each segment of a telescopic ladder locks safely in place, ensuring that you are stable and secure during use. Given the fact that there are so many segments, you can use your telescopic ladder for a variety of jobs that require different working heights, giving you the optimal reach every time. The Ohuhu 12.5 ft. aluminum telescopic extension ladder is an effective way to reach new heights. 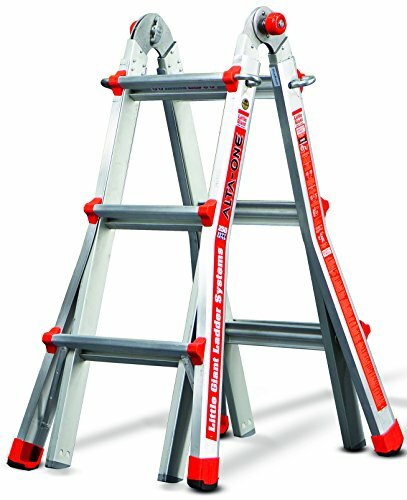 Built with a super strong aluminum alloy and featuring many aspects that make use easier, this ladder is perfect for the worker on the go or the home DIYer. You’re a busy worker, so getting your equipment from one site to the next can take a lot of time if the equipment isn’t optimized. The Ohuhu telescopic extension ladder features a carry handle that allows you to easily move your equipment without having to use two hands, freeing you up for more efficient moving. Retracting a telescopic ladder requires care and can take longer than you anticipated. 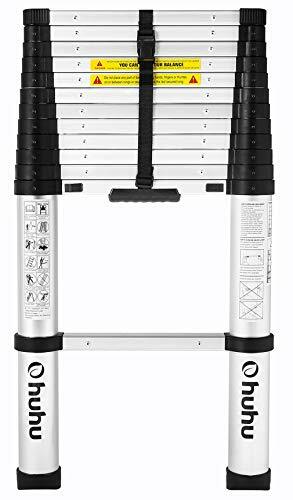 The Ohuhu telescopic ladder is designed to easily retract at the click of a button for a smooth and efficient pack up time. The most attractive feature of your telescopic ladder is easily the fact that it makes storage a breeze. The Ohuhu telescopic extension ladder takes this feature one step further by providing a storage strap that keeps your ladder secure during storage. When you’re after simplicity of use and strength for every job, the Good Life 12.5 ft. telescopic ladder is the perfect solution. With many useful features that allow you to quickly extend and retract the device, you’ll see a higher level of productivity across all aspects of your work. When you’re required to extend and retract your ladder frequently throughout the day, have you ever wondered what damage you’re doing to the ladder when you’re in a rush? The Good Life telescopic ladder features a no-pinch closure system that ensures the integrity of your ladder no matter the use. Staying safe while you work is paramount to your success throughout your days, and your telescopic ladder needs to live up to the task. 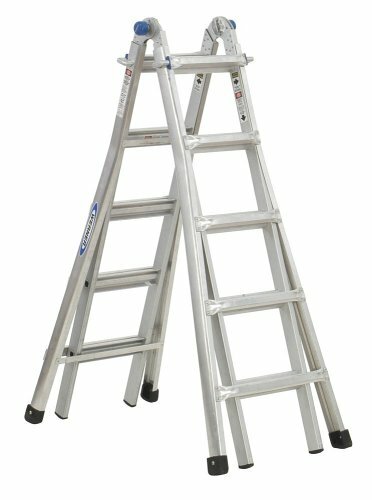 The Good Life telescopic ladder is built with a non-slip design, featuring end caps that grip along the wall for extra stability. The Good Life telescopic ladder is a beautiful ladder system that is designed for multi-purpose use. Whether you are painting, roofing or clearing your gutters, or using the ladder for your day to day work purposes, the ladder performs extremely well no matter the task. We know that sometimes you need the most sturdiest ladder system available. While not a telescopic ladder, we feel that the Little Giant Ladder Systems Alta-One ladder is worthy of making this list. The Little Giant Ladder Systems Alta-One ladder is constructed from heavy walled aircraft grade aluminum, which makes it one of the strongest items you’ll see on this list. With the ability to hold up to 250 lbs whilst retaining its lightweight design, you can climb safely in the knowledge that you’re using quality. The Little Giant Ladder Systems Alta-One ladder features an intuitive, multi-purpose design. Allowing for use as an A-frame ladder, while enabling you to extend it or use it as a scaffolding system, this ladder will make any work easy and efficient. The Little Giant Ladder Systems Alta-One ladder is designed for your ultimate security. The frame of the ladder features wide flared legs so that you’ll get better balance no matter how high you need to climb. We know that you need to reach higher. The Telesteps Professional Extension Ladder is designed to take you to the farthest heights, giving you 14.5 feet of ladder space in which to work. This professional-level ladder will have you working quickly and securely. Extending and retracting your ladder can often cost you precious work time. The Telesteps professional extension ladder saves you time by offering you a fully automatic extension system that allows for quicker, easier use. Storing your ladder in tight places is the best part of owning a telescopic ladder. 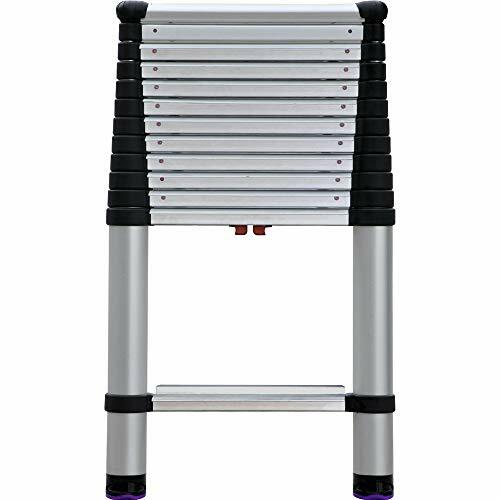 The Telesteps professional extension ladder features a tiny 33 inches of length when fully retracted, allowing you to transport or store it in the smallest spaces or vehicles. What do you do when your ladder can’t get you to the highest places? You’ll never have this problem with the Telesteps ladder, as it extends to 14.5 feet and allows for a climbing height of 18 feet in total. We have seen an A-frame ladder on this list already, but the Werner MT-22 telescoping ladder takes this one step further. With the addition of telescopic extension combined with the sturdiness of the A-frame design, you’ll feel safe and secure every time you use it. The Werner MT-22 ladder is absolutely stunning. It features a whopping 28 working heights that allow you to use the ladder as a two-person step ladder, an extension ladder or even scaffolding. This makes it the most versatile ladder yet on this list. It’s not just the design that made us so impressed with this ladder. The Werner MT-22 is able to allow for an amazing 22 feet of height, so that you can climb to the highest heights with ease and confidence. The Werner MT-22 is a professional grade solution for all jobs that require extensive heights. The rungs are double riveted, giving you confidence during use, and the non-marring feet are designed for reduced slip use, so you’ll always stay steady while working. Keeping your ladder simple is a great way to ensure maximum efficiency on the work site. The Core Distribution 770P telescoping ladder is designs for comfortable, easy use that you can trust at all times. Standing at 12.5 feet tall when fully extended, the Core Distribution 770P ladder allows for a superior reach height of 16.5 feet. This allows you to get into the hard to reach places, completing every job requirement with stability and dependability. The Core Distribution 770P is a smart choice for anyone who wants efficiency during transportation. Not only does it allow for easy extension and retraction, but it also features a convenient carry handle which allows you to carry it easily with one hand. The Core Distribution 770P telescopic ladder features a more compact design than most other models in its class. Retracting to a mere 32 inches and weighting 27 lbs, this ladder is compact, convenient and easy to store. Most telescopic ladders maintain an average maximum height of 12.5 feet, which is more than suitable for most tasks. However, if you require that extra little boost to get you to the highest work places, then the Xtend & Climb 785P telescoping ladder is perfect for you. The Xtend & Climb 785P telescoping ladder enables you to reach heights you never thought possible. With a full 15.5 feet of extension, you can work in higher places with the stability, safety and security that is most important to you. Opening and closing your telescopic ladder quickly should be easy, but often, you’ll find your fingers pinched by the retracting segments. The Xtend & Climb 785P ladder, however, features a no-pinch closure system that keeps your fingers safe from harm. Maybe you’ve never thought about the way your ladder looks, but you should. The Xtend & Climb 785P ladder is a versatile system that comes in many different colors, including blue, gray/yellow, red, black and green. If your ladder requirements range from day to day, then you need a solution that can provide you with the ultimate in versatility. The Finether extension ladder is a beautiful and robust system that allows for innovative use for your complex tasks. The Finether extension ladder boasts a highly configurable design, featuring strong locking hinges that allow for extension, support and flexibility. The ladder is able to be used as scaffolding, or as a double sided ladder, as well as a strong working platform for your routine tasks. Moving your ladder around while extended and unfolded can be tough when you want to get to new places quickly. The Finether extension ladder comes with strengthened wheel casters that allow for easy movement when you need it most. To give you that little bit of extra confidence during use, the Finether extension ladder features anti-slip suppers on the bottom of the ladder. Not only does this mean that you’ll experience the most stable and comfortable positioning, but you’ll also be able to work on different types of ground. Safety and security when you work is paramount to getting the job done right. The Yesker 12.5 foot telescoping ladder features many aspects that allow for easy, confidence use at all times. Some telescopic ladders are difficult to lock and unlock while you work. 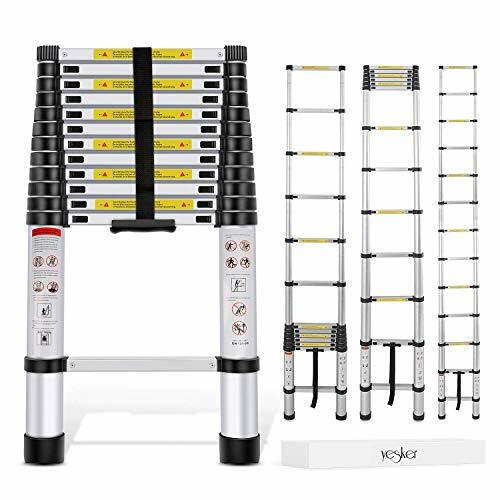 The Yesker telescopic ladder, however, is designed with easy to activate locking mechanisms that require just the flick of your thumb as you climb, saving you time while keeping you safe. Maximum adjustability is the key to getting the most use out of your telescopic ladder. The Yesker telescoping ladder allows you to set it to any height you please, in one foot increments across the length of the ladder. Don’t waste your time worrying if your ladder is going to stand up to the test of frequent use. The Yesker telescoping ladder features strengthened, reinforced rungs, supporting 330 lbs with ease and giving you confidence in your safe use. Last, but certainly not least, we present the WolfWise 12.5 ft. telescoping ladder. 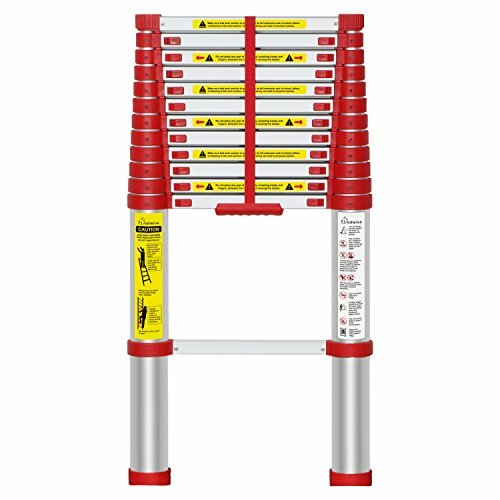 Constructed from the toughest materials and combining many non-slip features that ensure maximum safety with the bright colors of the frame, this ladder is perfect for people who put their ladders through rigorous use. The strong aluminum alloy used in the construction of the WolfWise telescoping ladder is corrosion-resistant while retaining the lightweight qualities that you desire. The 6061 aluminum is strong and inflexible, allowing for trustworthy use. 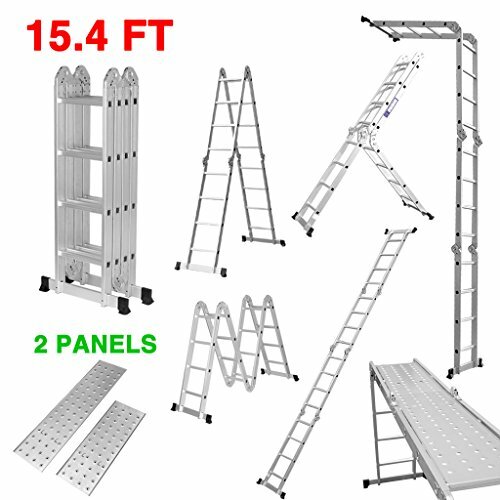 One of the most desirable features of your ladder is the ability to tailor the height to your specific needs. The WolfWise telescoping ladder allows you to set the height in one foot increments between 3 and 12.5 feet so you can work at any height you please. 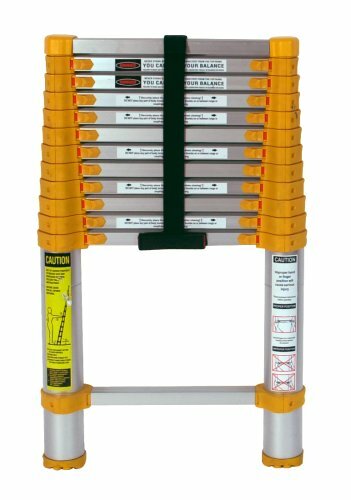 Rather than risk injury to your fingers on a daily basis, the WolfWise telescoping ladder is designed with a strong, no-pinch system. This means you can open and close the ladder easily without having to protect yourself. So you’ve picked yourself up a telescopic ladder. Congratulations! Your life just got far more easy. Before using your telescopic ladder for the first time, read the following instructions carefully for a step-by-step guide on how to use your ladder properly. The first thing you need to do is extend your ladder to the correct height. Do this by working from the bottom section. Move the support rings outwards until the section locks. Repeat for each additional section you need to extend. Before stepping onto your ladder, ensure that each rung is locked securely. Most ladders will have a visual indicator that will let you know that the rungs are securely in place. Place the ladder against the wall that you are going to be working on. The angle of the ladder should be 75 degrees from the horizontal surface for adequate support. Place the top supports of the ladder on the wall, ensuring that the no-slip bumpers make contact. The position of the rungs will let you know if there is anything amiss with the extension of your ladder. Ensure that the lengths between each rung is equal before beginning your climb. It may seem like an obvious step, but there is more to climbing the ladder than just stepping up. As you move higher, inspect each rung as you go. Each section must be properly locked before use, and catching this before you step on a rung is the best way to avoid injury. Once you’ve finished your work and climbed down from the ladder, it’s time to retract it. Support the ladder with one hand and use the other to release the locking mechanisms. Pull the ladder down with both hands until it is completely closed. What Can You Use A Telescopic Ladder For? It’s not just construction workers that benefit from a telescopic ladder system. Here, we take you through the most innovative ways to use your telescopic ladder. We need to repaint our homes from time to time, thanks to the normal wear and tear our walls experience. A telescopic ladder is the perfect solution for those who are short on space but need to reach their ceilings. Cleaning your gutters regularly is required for properly maintaining your home. However, it can be a tough challenge if you own the wrong sort of ladder. 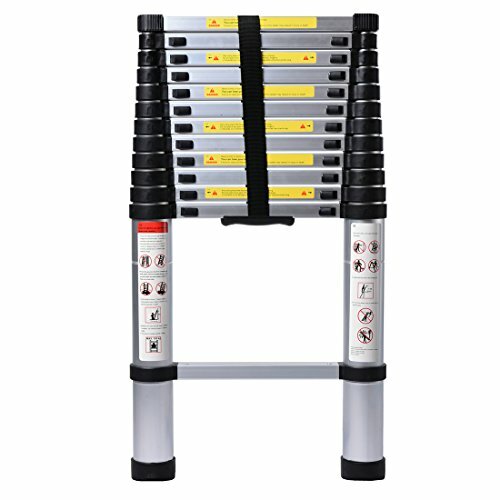 A telescopic ladder is perfect for those who need to get to the roof of your home easily, and can be taken out of storage conveniently for this task. Don’t spend loads of money on hiring a crew to trim your trees. With a telescopic ladder, you can easily reach these great heights in order to maintain your garden safely. The best kind of telescopic ladder for this purpose is an A-frame stepladder design. Taking your RV out on the road is an exciting time, but performing the routine maintenance tasks required to keep your vehicle in good shape can be tough without a ladder. Telescopic ladders ensure that you can easily provide the height you need while retaining the smallest storage footprint possible. Setting up your telescopic ladder in a safe and secure manner is the most important aspect of your use. Here, we provide you with several important safety tips to remember when using your ladder. Over time, the ladder will experience the wear and tear that is typical for such items. Given the number of moving parts and locking segments, it’s essential that you inspect your ladder before use. This way, you will stay completely safe at all times. If you’re making frequent trips to the top of your ladder, ensuring that it doesn’t slip is paramount to your safe and successful use. The rubber grips at the top of the ladder should be enough to keep the ladder in place, but you can increase your safety by tying the ladder at the same point of contact. One of the most important tasks that you must remain vigilant about is keeping the rungs locked as you use your ladder. Each time you ascend, pay careful attention to the locking indicator located on each segment of ladder that you’ve extended. If you’re afraid of heights, then climbing a ladder all day can sound like a nightmare. The anxiety you feel as you climb can manifest in physical ways and will amplify the movements and make you feel like the ladder is leaning. A good way to get around this is to ensure an even platform for your ladder, so dig a trench for which to set the bottom of the ladder on. Positioning a ladder properly is the best way to ensure complete safety. The angle of use should be 75 degrees from the ground for optimal use. In addition, you should make sure that you’re positioning the ladder in the correct orientation by placing the right way up with the correct side facing you. Once you’ve decided that a telescopic ladder is for you, follow these important considerations for choosing the right one for your work. Ladders can be extremely heavy and unwieldy to use, and this is the same for a telescopic ladder. If you prefer a model that is more lightweight, then carefully assess the weight ratings to ensure that you can easily handle it. Your ladder is designed to help you get to those hard to reach places, and as such, the extension height is a very important factor to consider. Telescopic ladders can be extended to a certain height but also any height in between, so if you need to reach taller places, opt for the highest ladder you can find that fits your needs. Ladders come in many shapes and sizes, so picking the right design can help you to achieve optimal use. Single ladders are just that – a single ladder that lets you rest it against the wall you’re trying to climb. These work best for reaching roofs, walls and gutters. Twin ladders feature a double-sided frame that can allow two people to climb on opposite sides and don’t require that you lean it against something. If you are working on windows or other things that don’t allow you to rest a single frame ladder, then a twin design is perfect. Many telescopic ladders will allow you to adjust to whatever height you need, but if you want a more specific working height then you can choose a model that features several adjustable positions. This may be a more cost effective solution for your ladder requirements. Q: Are telescopic ladders governed by international safety standards? Yes. 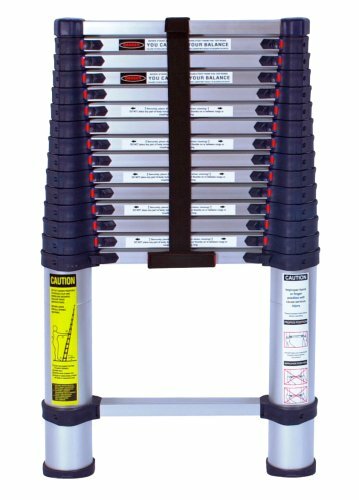 These ladders must meet the standards of EN-131 which ensures the minimum safety and construction levels that will keep you safe. Q: Can telescoping ladders be used as an A-frame? Yes, some can. If you require the use of a stepladder or A-frame design, ensure that your preferred model incorporates this use. Q: How do I trust that the ladder is properly locked? Most telescopic ladders will feature a visual locking indicator, letting you know when a segment is fully locked and ready for use. Q: Can I use my telescopic ladder against an RV? Yes. In fact, telescopic ladders are perfect for use aside an RV. Q: How do I protect my fingers when retracting my ladder? Ensure that you retract your ladder slowly and with two hands if it doesn’t feature no-pinch closure. Ensure your hands are on both sides of the ladder while retracting. Have you been inspired on all of the opportunities a telescopic ladder can offer you? Our favorite was the Finether telescoping ladder (#8). We loved the way you can configure it for any purpose and we think that the hinges and ability to use it as a work platform is one of the most innovative designs we have seen. A telescopic ladder confers so many opportunities for getting your home DIY or work assignments finished with simplicity and reliability, and if you find yourself on the road often, you’ll wonder what you ever did without one.